8.1" x 11.1" stitched on 14 count. 6.3" x 8.6" stitched on 18 count. 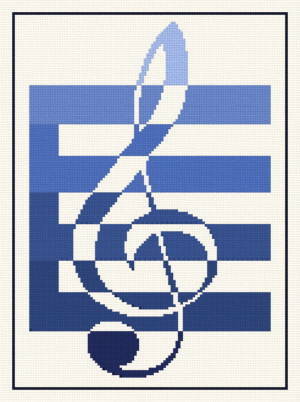 Treble Clef cross stitch pattern... A clef is a musical symbol placed at the beginning of the staff to indicates the name and pitch of the notes on that line. This design uses only full cross-stitches. Includes a slightly smaller version as well (101x126).